You don’t need lots of expensive equipment to make your own sausages as we explain, However, you do need to cook them properly to really appreciate the flavour and quality you’ve imparted. 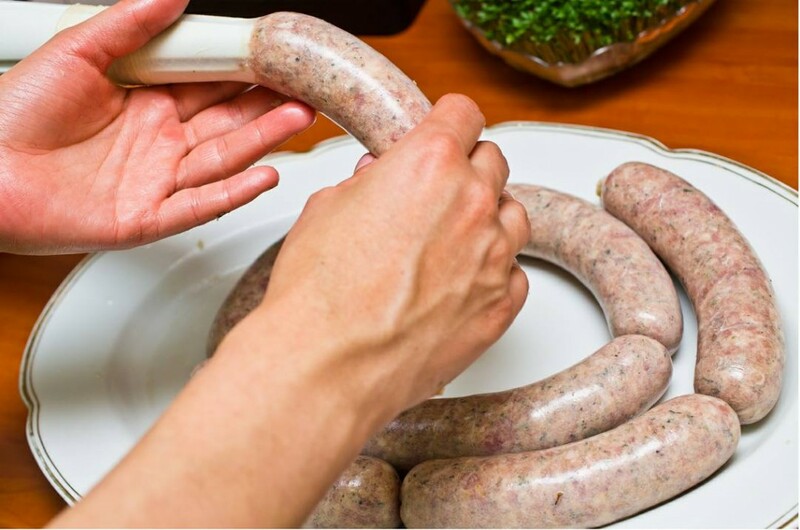 You don’t need lots of expensive equipment to make your own sausages. Some food blenders have as an optional addition, sausage filling nozzle attachments or you can buy little manual mincer / fillers that clamp onto a work surface for under £25.00. 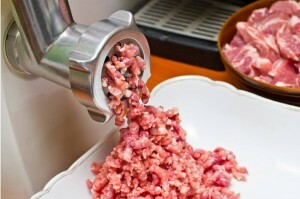 You can spend lots and lots of money if you are into shiny kitchen gadgets or just enjoy the pleasure of using top end appliances but the combined mincer and sausage stuffer that I routinely use to produce several hundred kilos of sausages annually cost just under £140.00. It has 3 gauges of stainless steel plates and a cutter for really easy mincing and a plastic sausage nozzle that works really well with both types of casing. If you are buying your ‘traditional & ethically reared pork’ then you’ll be able to buy it ready minced or you can ask your butcher to mince it for you. It should look nicely marbled with white fat inclusion – most ready minced pork is coming either from the belly area of the pig which is naturally fatty or accumulation of little bits from areas of hand knife trim when the entire carcass is butchered but you should ask prior to purchase if buying ready-minced. A proportion of less ethical, commercial sausage meat comes from old ‘culled’ breeding stock who have routinely received medications and treatments during their breeding life and once no longer commercially viable they are destined for the sausage factory. All meat should be kept at below 8 degrees C to be safe. Keep raw and cooked meat separate at all times and make sure raw meat can’t drip inside the refrigerator onto the other contents and contaminate them by keeping it on the bottom shelf if possible. If you are using frozen meats defrost at moderate room temperature or preferably over a longer period inside a refrigerator set to no higher than 5 degrees C. Don’t leave meat out in a warm room for prolonged periods once defrosted or food poisoning could ensue as bacteria multiply better the warmer it is. If frozen raw meat has been used to make your sausages then remember you can’t refreeze that meat until the sausage has been cooked. Clear away all clutter from your kitchen prior to getting raw meat and ingredients out for making your sausages and make sure you clean all surfaces thoroughly prior to making your sausages. Assemble all tools, equipment and have the ingredients to hand so you don’t go rummaging in cupboards with raw meat contaminated hands in the middle of making your sausages! Clean everything in your kitchen afterwards that could possibly have become raw meat contaminated when you have finished making your sausages. 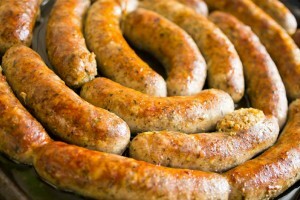 Once made, rest your sausages in a sealed container in the refrigerator for 24 hours prior to cooking. Any air pockets need to disperse and excess liquid needs to seep out if your sausages are not to split or explode when you cook them. Oven grilling is my preferred method of cooking home made sausages, well away from a moderately hot grill but oven baking on a moderate heat is the second best option with frying a last resort. With frying I find the heat is too intense and it is too messy. This gives a less pleasing end result and is less healthy.